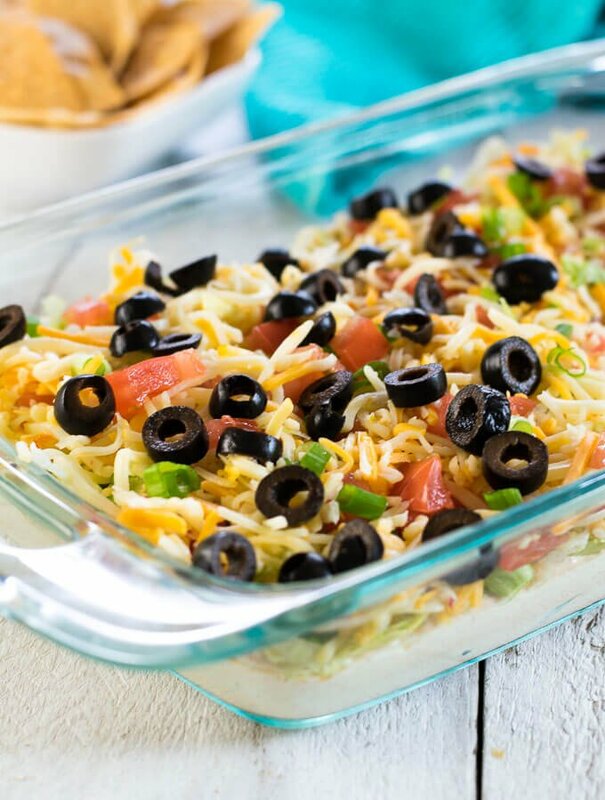 No party is complete without this Classic Taco Dip recipe, Simple to prepare, and a crowd favorite, you will be making this time and time again! I’ve been very forgetful the past few days. Yesterday I was shooting my bow and I forgot to nock an arrow before aiming and firing. Who does that?! I’m lucky I didn’t severely damage my bow and hurt myself. Then when making this Classic Taco Dip the other day, I finished my photo shoot before I realized I never added the sliced olives to the top. Doh! So if you notice you can only see one side of the pan in the photos, it may be because we already had devoured the other side! This is such a classic recipe, I feel any recipe index would be incomplete without it. It seems EVERY party you go to has taco dip on the table, and it is typically one of the first dishes to be consumed. I have a few tips to make this easy appetizer. I found if I use slightly more sour cream and whip the cream cheese, it makes a much lighter dip that is easier to scoop with any chip. Quite honestly, often a taco dip with cream cheese is so thick it is impossible to dip a chip into it without the chip breaking or scooping up a giant clump of dip. Not ideal. Ooops, someone forgot the olives! Also, if you have been doing your homework. You have already whipped up a big batch of my homemade taco seasoning to save in your pantry. This dip is a perfect recipe to use that in! 3 tbsp of my taco seasoning will be the equivalent of one taco seasoning packet. 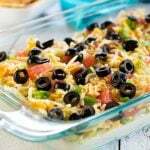 If you plan to make this taco dip recipe for a summer pot luck keep in mind, since it is dairy based, you don’t want to keep it in the heat all day. It should be consumed within four hours. This is true of any mayo or dairy based food. However, you can prolong the safety of your food by using a Chilled Dipping Bowl that stores ice underneath. The above link is an affiliate link. 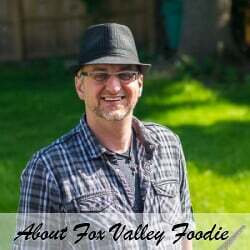 Any Amazon purchase made through this link helps support FoxValleyFoodie.com at no additional cost to you. 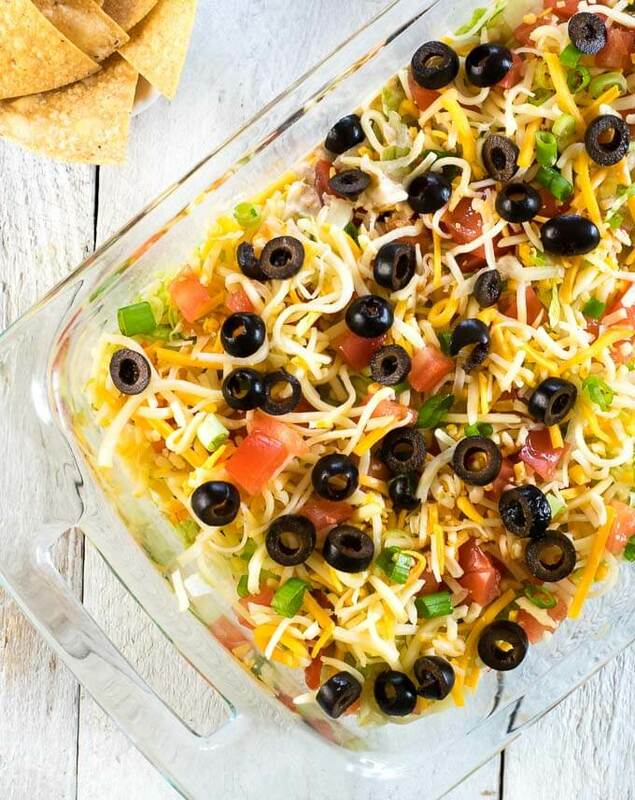 Taco dip is not the only appetizer you can bring to a party or potluck. Finger food is always a great option, such as my Mexican Tortilla Pinwheels, or Bacon Jalapeno Popper Pinwheels. I also recommend adding dips to your party appetizer menu. Options such as Cheddar Dill Pickle Dip, Bacon Jam, and Chicken Liver Pate are always a huge hit! Soften the cream cheese by letting it warm up on the counter, or whip it with a hand mixer to lighten it, then combine with sour cream and taco seasoning mix. Add mixture into serving tray (11x7" dish works well) and spread evenly across bottom. Sprinkle lettuce over the top, then add cheese, tomatoes, olives, and green onions. Save yourself time and money by using my HOMEMADE TACO SEASONING recipe. Make a big batch and store it in your pantry! 3 tbsp = 1 package. If you prefer a dense dip consistency, use 8 oz sour cream instead of 16 oz. IF YOU LIKED THIS RECIPE check out my Taco Salad with Doritos recipe too! If you enjoyed reading my Classic Taco Dip recipe then you should probably like me on Facebook and follow me on Pinterest too. That’s what I would do at least, because if you don’t get to know me but you still use my recipe it is kind of like taking candy from a stranger, and your mom taught you not to do that. Don’t disobey your mom, subscribe to Fox Valley Foodie today. It isn’t a party without taco dip! This was the best taco dip I’ve had! Delicious and addicting. Made this for a church potluck and it was devoured within moments! I am glad everyone liked it! This is a classic recipie in our family! But we add ground turkey!